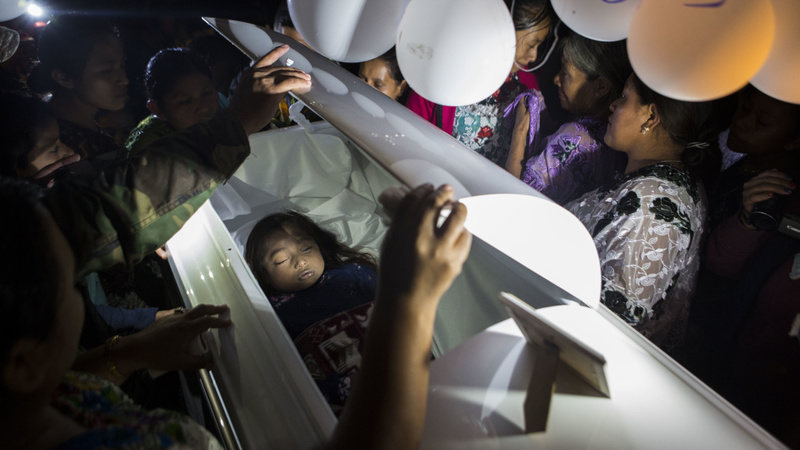 Family members pay their final respects to 7-year-old Jakelin Caal Maquin during a memorial service in Guatemala, on Dec. 24, 2018. Jakelin died while in the custody of U.S. Customs and Border Protection. An autopsy report has revealed that a 7-year-old girl who migrated to the United States from Guatemala died from a bacterial infection known as streptococcal sepsis while in the custody of U.S. Customs and Border Protection. Jakelin Caal Maquin had traveled to the U.S. with her father 2,000 miles from northern Guatemala. She passed away in December, two days after they were detained by border officials. By the time Jakelin was transported to a children's hospital in El Paso, Texas, she was vomiting, having seizures and had difficulty breathing. The medical examiner's office in El Paso released its autopsy report on Friday showing that streptococcus bacteria was found in the girl's lungs, adrenal gland, liver and spleen. The report says the infection led to the failure of multiple organs. Jakelin's death has underscored the dangers migrants face when traveling to the U.S. and added to the criticism of the conditions they can experience while in U.S. custody. "When Jakelin Caal Maquin presented to the Border Patrol facility in New Mexico, there was no specific review of experiences, signs or symptoms that would have identified that she was sick," said Rep. Raul Ruiz, D-Calif., in an interview with NPR. "There was no physical examination including a very basic vital signs that would have most likely identified that she had a fever ... or a fast heart rate." According to The New York Times, several physicians who reviewed the autopsy report said Jakelin "would have been visibly sick for many hours." "Something definitely went wrong and is wrong with our system, that we need to correct by creating a set of humanitarian standards that the CBP must abide by which would include a meaningful health screening, a meaningful coordination with health trained providers that can give guidance and the care that is needed," Ruiz said. "Border Patrol Agents, including trained Emergency Medical Technicians did everything in their power to provide emergency medical assistance for Jakelin Caal Maquin immediately after her father notified the agents of her distress at a remote Forward Operating Base, 94 miles from the nearest Border Patrol Station ... Despite our trained EMT agents' best efforts fighting for Jakelin's life, and the work of the Hidalgo County and Providence Children's Hospital medical teams treating her, we were unable to rescue her." According to the Times and CNN, lawyers for Jakelin's family are calling for an independent investigation. Ruiz told NPR that conditions in migrant shelters are "petri dishes for people to get sick." Ruiz told NPR that the shelters he visited in New Mexico after Jakelin's death had no baby food or formula or appropriate food for elderly people. Migrants would have to request water, and sometimes were not given the sufficient amount of water per day, Ruiz said. Many in the shelters were not able to sleep, he added, saying the shelters contained "children laying on concrete floors, in very, very cold rooms, with the lights on all night, and being interrupted with loud noise, throughout the night." "The CBP was not created to address the humanitarian needs of families who are legally seeking asylum in our country," Ruiz said, "and therefore the conditions that the women, infants, toddlers, elderly, find themselves are subhuman." CNN reports Jakelin's father has requested a "credible fear interview," which is granted for people who have been "persecuted or have a well-founded fear of persecution on account of your race, religion, nationality, membership in a particular social group, or political opinion if returned to your country." After her death in December, Jakelin's body was returned to the indigenous community of Raxruha in Guatemala, where she was from.